Ready, Steady, Cook and Strictly star Ainsley Harriott has praised a unique, new curry recipe developed in a Bolton Indian restaurant as ‘better than a Balti’ after sampling it at Bolton Food and Drink Festival on Sunday 27 August. The new dish, dubbed ‘the Bolti’ in honour of its Bolton origins, has been unveiled exactly 40 years since the creation of one of the UK’s favourite curry dishes – the Balti – in Birmingham. The Bolti was developed by one of Greater Manchester’s best curry restaurants. The unique dish is based on a traditional Balti recipe, but has been enhanced with achari pickle, along with Lancashire Sauce made by family firm Entwistle’s of Ramsbottom. 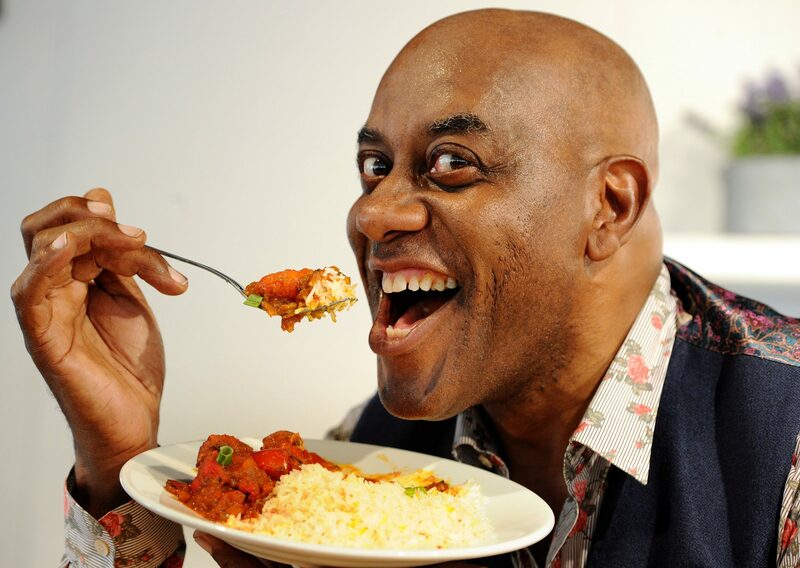 Ainsley, who has been one of the nation’s favourite TV chefs for almost two decades, sampled the dish when it premiered after his first-ever cookery demonstration at the festival, which runs from Friday 25 – Monday 28 August. Ainsley said: “The Bolti is delicious. I absolutely loved it. It has a tangy, spicy flavour and is very aromatic, and really moves on and develops the original Balti recipe. The Lancashire Sauce and achari pickle add a whole new dimension. The Bolti was developed by the Royal Balti House in Farnworth, which scores five out of five on Trip Advisor and has won a series of awards. Manager Keith Meah and chef Anwar Hossein developed the dish in response to demand from regular customers who had tried everything on the menu and wanted something bigger and bolder. The Bolti has proved such a hit with locals that it is now set to be added to The Royal Balti’s regular menu. Mr Meah said: “We’re thrilled that Ainsley loved our Bolti! It is wonderful that a top chef like Ainsley has given it his support. “We’re great fans of the Balti – we specialise in them, and that’s reflected in our name. We have many regulars who want to try something that’s not on the menu and so we create new dishes for them. They love this new recipe. Balti curries are a staple on the menus of Indian restaurants throughout the UK and are enjoyed by thousands of people nationwide every week. The Balti thought to have been first dished up in a Birmingham restaurant in 1977. Have you tasted the Bolti? I’d love to know what you thought of about it. For more information about this cool restaurant, hop on over to their website now.